DAMASCUS, SYRIA - The U.N. envoy for Syria held 'substantial' talks Sunday in Damascus with Foreign Minister Walid Muallem on efforts to find a political settlement to the country's eight-year-long war. 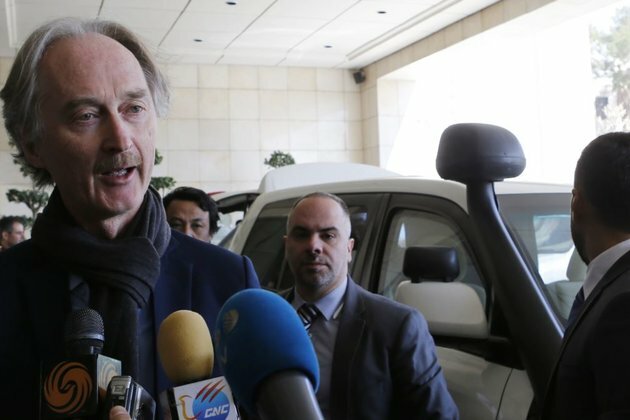 'We have had very detailed substantial discussions,' Norwegian diplomat Geir Pedersen told reporters after the meeting. 'We are now addressing all the issues so all the issues are at the table,' he said, without specifying. 'Let's see how we are able to proceed later this afternoon,' he added. He became the fourth U.N. negotiator aiming to resolve Syria's conflict following the resignation of his predecessor Staffan de Mistura. Since early January, he has traveled extensively to meet with the government, opposition and others. The U.N. Security Council remains deeply divided over the way forward in Syria. Veto-wielding Russia, a key backer of President Bashar al-Assad, has taken a lead role in diplomatic efforts through the so-called Astana group with Iran and Turkey that has largely sidelined U.N. diplomacy. Syria's war has killed more than 370,000 people and displaced millions since the conflict began with the repression of anti-government protests in 2011.